Arrival at the airport, transfer to Hotel Renaissance Minsk**** or similar, check-in, welcome meeting. Minsk is one of the last undiscovered secrets of Europe, modern and historical at the same time, a green city with a cosmopolitan and bustling atmosphere and surprisingly bright, clean and safe. The morning sightseeing tour takes us to the Independence Square and the Independence Avenue with its amazing collection of Stalinist Classicism, the Old Town, the Island of Tears, the reconstructed Trinity District and the Janka Kupala Park. The afternoon offers optional visit to Museum of the Great Patriotic War - a museum which occupies area of 3000 sq.m. houses more than 8000 exhibits. The morning is reserved for an optional excursion to Catholic and Orthodox Churches of Minsk including the Orthodox Cathedral of the Holy Spirit. 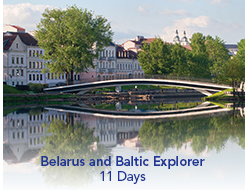 In the afternoon we are driving 180 km to reach Vilnius, check-in at Hotel Radisson Blu Lietuva**** or similar. Heading for Riga, the first stop is the Hills of Crosses, one of the most holy sites of Catholic Lithuania. After crossing into Latvia, we soon reach the magnificent Rundale Palace, the former summer residence of the Duke of Courland. Following a guided tour of the palace we travel through the rolling hills of Southern Latvia to reach Riga late afternoon, check-in at Hotel Radisson Blu Latvija**** or similar. Before we get acquainted with Riga we have the possibility of discovering medieval Latvia. The optional tour for this morning takes us to the stunning scenery of the Gauja National Park and the town of Sigulda. We listen to the medieval Latvian legend of the Rose of Turaida, and see the ruins of the Episcopal Castle and of the Castle of the Knights of the Sword before we return to Riga. The afternoon offers an optional visit to the Ethnographical Open Air Museum, a spacious exposition of 18th century country life. The evening offers an optional organ concert at the Dome Cathedral. Riga founded in 1201 by the German bishop Albert is the largest of the 3 Baltic capitals and boasts a true kaleidoscope of various architectural styles. The walking tour of the Old Town includes Riga Castle, Dome Cathedral, St. Peter’s Church, Swedish Gates, Three Brothers, Large and Small Guild House and the Freedom Monument. The afternoon is reserved for an optional visit to Jurmala, the vibrant Latvian sea resort, famous for its wooden architecture and sandy beaches. In the evening enjoy an optional Latvian dinner at the stylish Restaurant La Boheme.